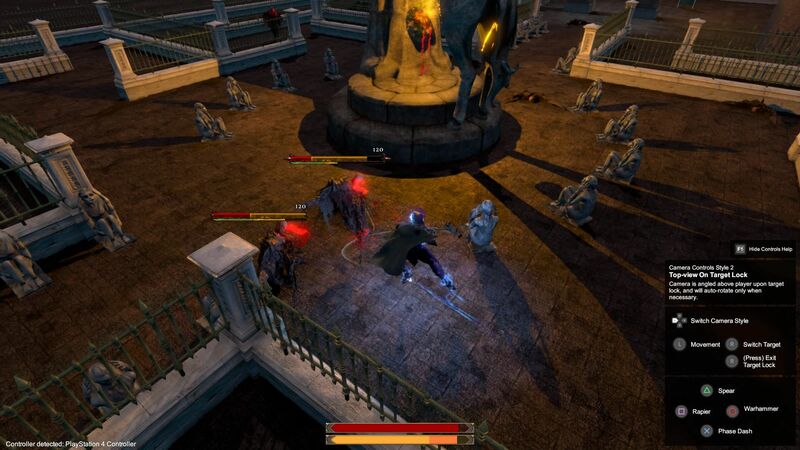 Ghost Knight Victis is an action RPG about a terminally-ill superhero fighting against an invasion of Lovecraftian horrors. Inspired by the henshin hero genre (Karas, Kamen Rider, Garo, etc. ), you play as a guy whose terminal disease awakens dormant powers, letting him transform into magical armors and fight monsters. Added the Warhammer weapon. For those using mouse & keyboard, this is activated by pressing both left and right mouse button at the same time. If your mouse has back and forward keys, those are binded to the warhammer as well. Note: the game will have rebindable controls in the future. Warhammer has a charged attack (hold the button then release). It can be followed up with two more warhammer attacks in a combo (if you have enough stamina). Added parry ability to the Rapier. 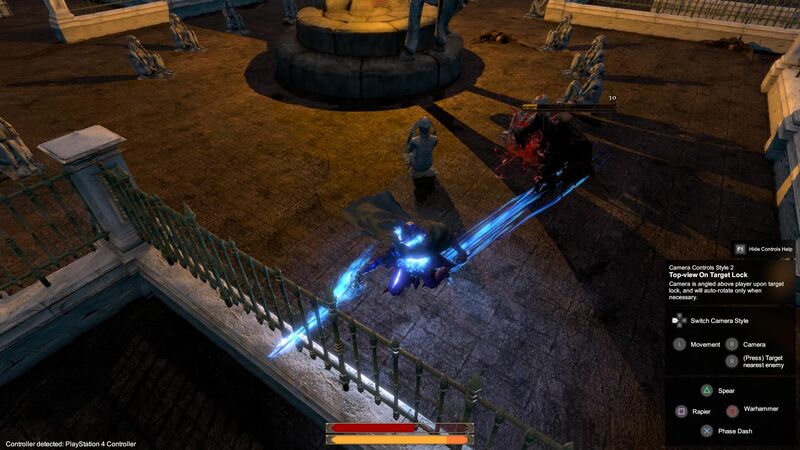 Parry automatically happens on the first and second of the Rapier's regular attack combo (those attacks can damage and parry at the same time). To perform this properly, you need to time the attack just as the enemy's attack meets with your weapon's slash movement. Moved the player's health and stamina bar to the bottom of the screen. This is an experiment to see if that makes it easier to glance at your health/stamina (as opposed to when it was at the top-left corner of the screen). I know activating Warhammer attack by pressing both left and right mouse buttons can be buggy (it would sometimes register as a rapier or spear attack if you didn't press both buttons at exactly the same time). I don't have a fix for this right now. If your mouse has back and forward buttons, you can use those instead (either back or forward will activate the warhammer). There are no optimizations yet. There are toggles for the graphical effects, but they are there more for your personal preference. If you're running the game on a toaster, consider yourself warned. Try running the game in a low resolution (800x600 if need be). There are no unique combo strings. Attacks in this game work more similar to Dark Souls, and not God of War. I know the impression right now is there are not a lot of attacks. 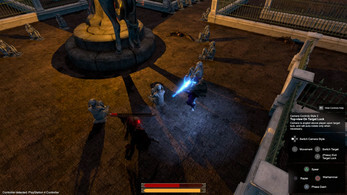 There will be more variety of attacks you can perform in future versions of the game, as I implement more features (weapon abilities, spells, a 2nd set of weapons). As some of you have mentioned, you can hit enemies through fences/obstacles. You are not supposed to be able to do this, but I haven't fixed it yet. Some of you suggested keyboard controls for switching targets. I like that idea, but I have not implemented it yet. Some people do not understand how the stamina bar works. In the future I may add a simple tutorial to explain this. You will die quickly if you allow yourself to be surrounded. This is intentional. Can't customize control bindings yet, but it will be added. The difficulty right now is not yet representative of the final goal. 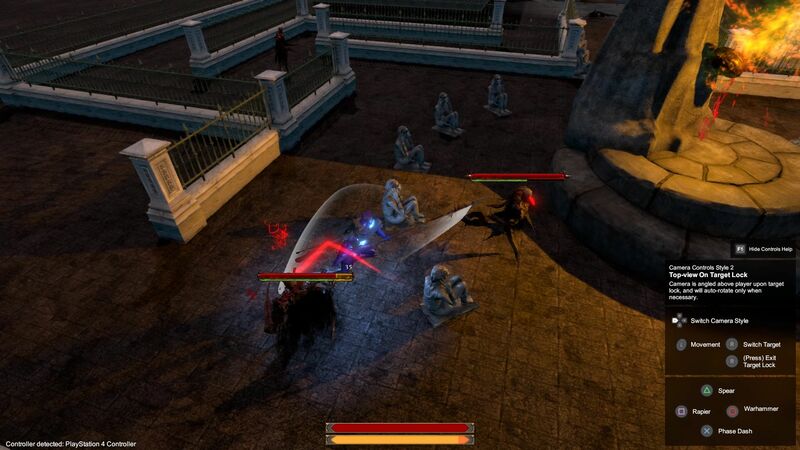 Attack animation speeds, enemy AI, damage values, and stamina costs are continually subject to tweaks/balancing. Demo at least seems to play out in true spirit to dark souls in regards to getting hit and hitting through fences/walls, outright failing to hit with your rapier right after an enemy's 3 move string until they recover(does not apply to the other weapons as they have good hitboxes), poise not existent for the player, spear instantly breaks enemy poise, able to stunlock enemies by quick charging warhammer specials one after another, AI that seemingly can't stop throwing itself at you in a straight line. Thankfully you can't get hit through parry with lag. Phase dash is great as it actually carries some risk given you can't move straight after nor affect its trajectory with DI. You're possibly one of the only devs that I've seen so far to actually implement a settings menu in his demo for the player, congratulations. On the animation side of things, feedback unlike Dark Souls is awkward as if I am in the process of getting hit I'll never know when I'm able to input an action, limiting my options to spamming the spacebar key in hopes of being able to phase dash in time to dodge an incoming attack. A hit recovery animation would be swell here as it gives the player feedback that he has regained control of his character. 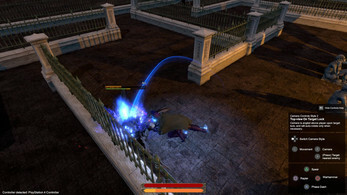 Enemies are freely able to get away from any normal attack strings after recovering from their attacks including the use of all three weapons until their AI kicks in telling them to attack once they've replenished enough stamina. Intended parry timing feels perfect. AI also don't play well as a team and each do their own thing. If you're up to the challenge, I suggest right after fixing the AI and enabling them to attack more than one at a time, to be able to parry 2 or 3 hits(limit and usability defined by you) if they connect at the same time. Best of luck. The rapier's attacks indeed doesn't reach an enemy that's sort of in a crouching position, I was thinking of making your character lean downwards in those situations so the rapier can hit, but that's not at the top of my things to do right now. The part about you not being able to move too long after getting hit is a bug. You certainly are supposed to be able to reasonably dodge away after getting hit the first time, so you don't get combo'd. I've fixed it in my current build, and now it ignores movement input only for a short span of time when you get hit (I'm still tweaking how long it should be). I haven't really planned for anything regarding poise/flinch resistance, and I'm only wondering about it now how to go about it. For one, the purple armor type the player currently has should not have much flinch resistance, if at all, as he's the speedy type in contrast to the 2nd armor type I'll be making later on: a brutish offensive kind which I'll certainly give a lot of flinch resistance/poise. I think I'll also experiment with making the spear not instantly break enemy poise. The AI right now is very simple/dumb. They're easy to kill, and their only threat is if they attack you in groups, and even then they don't coordinate. Generally, for these one-eyed enemies, I think I'll keep them that way. In the lore, they are just mindless golem-like creatures created out of scrappy wood and cloth. Right now I'm implementing more of the player's abilities, then I'll work on the AI again after. Perhaps a new enemy type later on. Alright, hope to see some interesting developments even if multi-parry isn't included. Best of luck.